~ My CCIE Wireless Journey & More….. In CCIE wireless lab version 2.0 equipment list Cisco 6506-E listed with 12.2 SXI IP Services feature set. Why this is important when configuring Spanning Tree Protocol (STP) ? From this software code onwards Cisco has changed terminology slightly & you need to be familiar with configuration syntax. In this post we will see how to configure basic STP features & in the next post look at how to configure optional STP features like Portfast, BPDU Guard, BPDU Filter, Root Guard, etc. STP defines a tree with a root bridge and a loop-free path from the root to all network devices in the Layer 2 network. STP forces redundant data paths into a standby (blocked) state. If a network segment in the spanning tree fails and a redundant path exists, the STP algorithm recalculates the spanning tree topology and activates the standby path. Here is the default STP configuration settings when it enabled. Spanning Tree will be enabled for all vlans you created on the switch (by default enable it on vlan 1 as well). You can enable/disable it per VLAN level & below show the basic configurations to do that.”default spanning-tree vlan vlan_ID” command will set all STP parameters to default value for that vlan. If you want to configure extended range vlans (1024 – 4096) you have to enable extended system id for STP. “spanning-tree extend system-id” global configuration commands will do this. “show spanning-tree summary” command can be used to verify this setting. 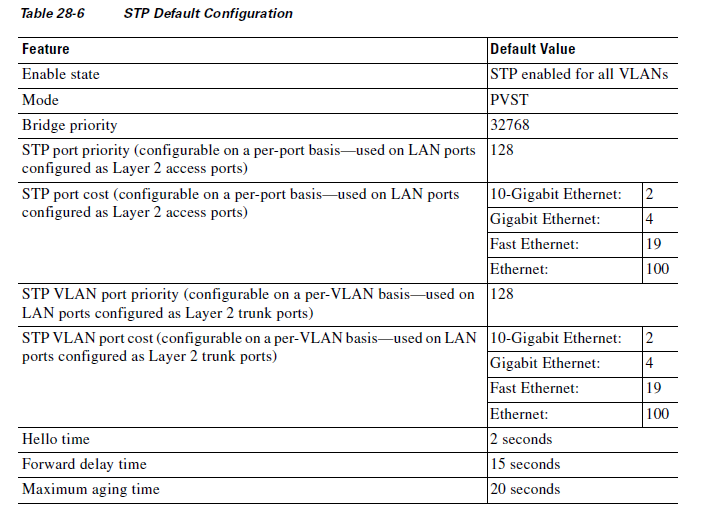 You can configure STP mode as follows & above command can be used to verify. You can configure a switch to become STP root bridge by changing the bridge priority values which is multiplier of 4096 (0,4096,8192…..,32768,…..,61440).If you want to ensure no other switches become a root, you have set bridge priority to 0 for a given switch for a vlan or vlans. If you want to make another switch to become secondary root, you have to give next lower priority (which is 4096) and leave all other switches default priority (which is 32768) or any other value higher that 4096. Here is sample configuration if I do this unless asked to do this any otherway (eg. Do not use spanning-tree priority command to do this). Lets say 6506-A should become STP root & 6506-B to be secondary for all vlans. If a loop occurs, STP considers port priority when selecting a LAN port to put into the forwarding state. You can assign higher priority values to LAN ports that you want STP to select first and lower priority values to LAN ports that you want STP to select last. If all LAN ports have the same priority value, STP puts the LAN port with the lowest LAN port number in the forwarding state and blocks other LAN ports. The possible priority range is 0 through 240 (default 128), configurable in increments of 16.Cisco IOS uses the port priority value when the LAN port is configured as an access port and uses VLAN port priority values when the LAN port is configured as a trunk port. 6506(config-if)#spanning-tree vlan 999 port-priority ? 6506(config-if)#spanning-tree vlan 999 cost ? Timer values (hello, forwarding-delay,max-age) for STP can be changed by using following configuration commands. That covers the basic STP configuration. Did you notice any specific syntax to 12.2SXI ? No, these specific syntax is required when you configure optional STP features which will look into next few posts. You can read Cisco IOS Software Configuration Guide-Release 12.2(33)SXH and Later Releases. (Chapter 28) for more detail.